As Rowan was kind enough to design and host an official author and publisher website for my publishing work, it is time to dedicate a blog to my writing that is not on my printer's site. Here I will publish updates as to when volumes are released for sale, tips on writing, and freebies. I'd like to thank my family for supporting me this far, as I already have one novel and one poetry book published and available, with more on the way. I also want to thank my friends, old and new, that have expressed interest and support, and that have helped out, including those already in the publishing industry and sharing their wisdom with me. "Dragon Shaman" was first inspired as back story for a character I included in some stories I'd originally started writing with my daughter in mind (these took off in their own direction with their own ideas) with the genesis of my character BlowingWind. BlowingWind is a young lady of mixed heritage that has a lot in store for her as she learns more of what it is to live, how to fix mistakes of the past, and how to blend the worlds of spirit and man without going too far one way or the other. She has a long road ahead of her from her start point in "Taming the Blowing Wind" that I project will span eight books for herself and her family, with a surprise ending at the very end. "Call of the Kami" was inspired when I began to get back into poetry after a very long time away from it. I was encouraged at the publishing of "Moving On" and "Red Arched Bridge," and both of these poems found their way into this book as well as I retained my copyrights. Currently, I am in the process of writing the second book in my "Dragon Shaman" series, "The Smoky Mirror." 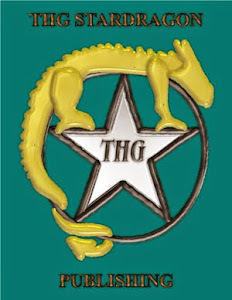 Please check out the website for THG StarDragon Publishing, and happy reading.